Divers from the Office of National Marine Sanctuaries and Eastern Carolina University photograph the German U-boat U-352. U-352 was surveyed off the coast of Morehead City, N.C., during the Battle of the Atlantic Expedition Summer 2008. The wreck site was surveyed using traditional archaeological mapping techniques coupled with video and photographic documentation. The site was discovered in the 1970s and has suffered the effects of storms, time, and looters. NOAA's objective during the survey was to map the site in detail and to assess its historical significance and archaeological integrity. 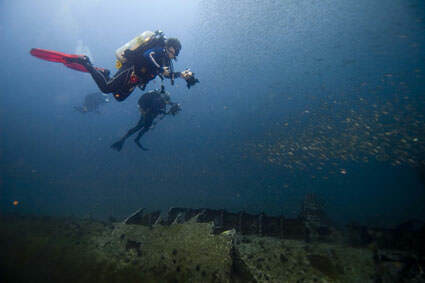 NOAA divers used various technologies to document the sites, including employing underwater cameras and sonar to create a photo-mosaic of the wreck.